As students of working class and union history know, one of the ironies of the past 35 years of labor history has been that from time to time unions and union leaders who should know better fall prey to some version of "greater and lesser evilism" and support candidates, whether Republican or Democrat, who are really working against the workers the unions supposedly represent. The most dramatic (and in many cases tragic) example of that mistake came in 1981. Following their support for the (former union officer) Ronald Reagan for President in 1980, PATCO (the Professional Air Traffic Controllers union) thought it could get a better deal for its members from Reagan, who they had helped put into power. The rest is history. Not only did Reagan not help PATCO, but the ruling class used the PATCO strike as an excuse for breaking the union completely, destroying many of its members (some even killed themselves in the backwash of all that) and then preaching a union busting version of history (inaccurate, as we proved in Chicago) that claimed to prove that striking is futile and subservience to the master is the only way servants can aspire to improve their lot. 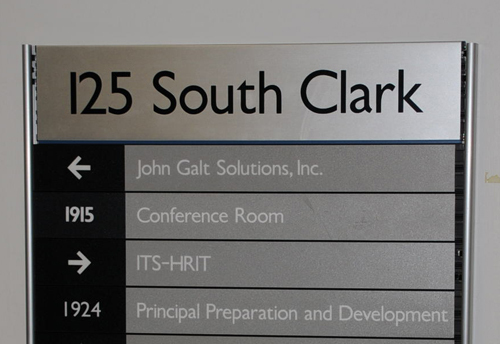 For more than a decade, since Arne Duncan became "Chief Executive Officer" of CPS, "John Galt Solutions" has had space at the Chicago Board of Education's headquarters in Chicago. Above, the directory of offices on the 19th floor of 125 S. Clark St. about a year ago. Substance photo by George N. Schmidt.Now in the aftermath of the selection of the reactionary "Atlas Shrugged" Paul Ryan to be the vice presidential candidate of the Republican Party, In These Times publishes an expose of one of the "labor" roots of Ryan and Ryanism. The GOP has often accused unions of unfairly coercing members into paying dues — dues that happen to be a major source of support for Democratic candidates. However, an investigation by In These Times reveals that GOP vice-presidential nominee Paul Ryan is closely tied to a union accused of retaliating against members who dared criticize its financial backing of Republican candidates. Among those candidates were Wisconsin Gov. Scott Walker and Paul Ryan himself. with the National Labor Relations Board over charges that the union condoned violent threats against members who spoke out against the union's political stances. of $48,500 in payments to his campaigns. Fred Higgins, a member of Operating Engineers Local 139, says that he and fellow union members have faced severe retaliation for speaking out against the overall direction set by union business manager Terry McGowan, including close relationships with Republicans such as Paul Ryan. As a result of not supporting McGowan, Higgins says, he and other members were routinely denied work by the union's hiring hall. In construction unions, members get work contracts through their union halls, based on a priority number determined by seniority and other factors. Higgins says that, despite being high on the list, he received only a handful of weeks of work in 2008 and 2009. Along with other union critics who received infrequent work assignments, Higgins demanded to see the union's hiring hall procedures. But, he alleges, McGowan illegally refused to post a copy of the procedures in plain public view--so Higgins and two other members of the union, Tim Pare and Randy Heule, filed a complaint with the National Labor Relations Board. After the compliant was filed, McGowan called a May 2010 union-wide meeting at Operation Local's Pewaukee union hall, where he allegedly berated the dissident union members in front of a packed crowd. McGowan reportedly told the assembled union members that they would be denied raises because of the three who had filed charges. The crowd, at the encouragement of McGowan, turned raucous against the three men; according to Higgins, someone in the crowd threatened to "track down" Pare's daughter's truck and read her license plate number aloud. After the meeting, Pare filed a second complaint alleging that McGowan "condoned threats of violence made by members against other members because they filed charges against the Union with the National Labor Relations Board." The union agreed to settle the charges. As part of the settlement, the union was forced to post a notice in its hall saying, "WE WILL NOT condone members threatening other members with physical harm because they filed charges against the union with the National Labor Relations Board." The union was also required to state in the notice that it would not "threaten members with job loss, monetary consequences or expulsion from the Union." In a separate ruling, the National Labor Relations Board found that Lewis Yuker, a foreman employed by URS Energy and Construction who was also a member of Operating Engineers Local 139 and brother of one of McGowan's staffers Guy Yuker, illegally laid off Tim Pare from his job because he filed a complaint against the union with the NLRB. Pare has since been reinstated to his job at the order of the National Labor Relations Board, and could not be reached for comment. Fred Higgins's case was dropped by the NLRB, and he is in the process of filing another complaint. Meanwhile, he says, he has received only a few days of work in the past year, despite being number 4 on the priority list. For now, Higgins is drawing down his savings and hoping he can survive until he can find work again. "McGowan has supported Paul Ryan for years as part of his connections to Ryan's family business," says Higgins. "McGowan absolutely supports anybody who supports him--and if you don't, you can get retaliated against like me." Romney-Ryan campaign spokesperson Andrea Saul did not respond to email inquiries about Ryan's relationship with the union. It's clear, however, that the relationship has been mutually beneficial. Local 139 was the only private-sector union in Wisconsin to back the Walker budget that stripped public employees of their right to collectively bargain. Ryan has in turn supported construction unions against GOP assaults; last year, Ryan worked against GOP leadership to defeat by one vote a proposed ban on union-friendly Project Labor Agreements. By ensuring that union labor is not at a disadvantage in getting federal project bids, such agreements help both unions and unionized construction firms such as Ryan Inc.
"We all know--or should know--that if an anti-union politician like Gov. Scott Walker or Paul Ryan wants to support a union, it's a just a temporary deal; it's just words. What he is actually supporting is unionized contractors," says Higgins. "It's about getting road contracts. Ryan is helping his family; they are in the road construction business." We will have to what and see if a Republican whose party depicts union leaders as "thugs" is willing to denounce a union so close to him that has appeared to engage in coercive behavior. Ryan's relationship with Operating Engineers Local 139 raises serious questions about exactly what party the so- called union thugs are backing in this election. Operating Engineers Local 139 business manager Terry McGowan agreed to speak with In These Times this morning. In response to questions about his union's support of Paul Ryan, he said, "I don't agree with Paul Ryan on his politics, but he is a Davis Bacon, anti-right-to-work Republican. He supports the right of workers to make a fair wage on federally funded projects. He's a leader in the House and if we were to break off our relationship and find a different direction, I fear we would lose a lot of Republicans on these issues." McGowan said his union will not be supporting Mitt Romney, but added, "If they were to win, do I feel I could go to Paul Ryan and talk to him about right to work and have a conversation? McGowan denied allegations of condoning violent threats against union members. He stated that Fred Higgins' lack of work assignments have to do with his lack of specific skills (a claim Higgins disputes). McGowan was unwilling to comment on specifics in the NLRB complaints. [Mike Elk is an In These Times Staff Writer and a regular contributor to the labor blog Working In These Times. He can be reached at mike@inthesetimes.com. A native of Pittsburgh, Mike Elk is an award winning labor journalist based in Washington, D.C. As an investigative journalist, Elk uncovered how Citizens for Responsibility and Ethics for Washington (CREW) was working in conjunction with corporate lobbyists to attack the credibility of pro-student lending reform advocates...While covering a lockout at Honeywell uranium facility in Southern Illinois, Elk uncovered how Honeywell cheated the safety tests given to scab replacement workers at a uranium facility causing multiple accidents and releases of toxic gases. Union leaders have cited Elk's investigative reporting as being crucial to help resolving their year-long lockout.